I have my Rachio 3 set up to run a flex schedule on my 8 zones prior to sunrise. 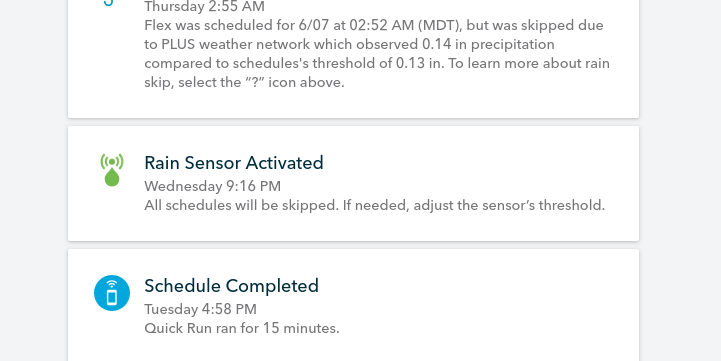 It’s been working fine for a couple weeks now but today when I woke up I saw in the history that only 3 out of my 8 zones ran and the watering didn’t even start until around 5:30am when it normally starts around 2:30am. I ran a test on all zones from the app and all of them are working fine manually. What’s going on?? This could have been due to your rain sensor being activated for part of the schedule. If you still experience any issues please let us know. And thanks for supporting a local Colorado business!